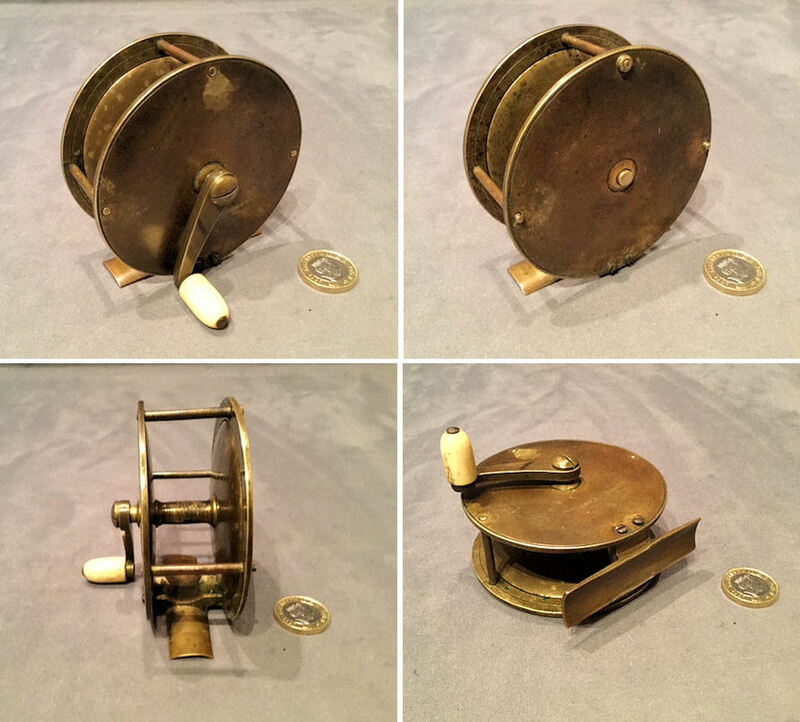 Original, quality late 19th century brass fly fishing reel with a handle wind with a turned bone grip and 3 3/8" diam plates to the body, all in the unpolished patinated finish. Complete and in good and working order. 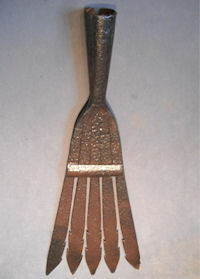 3.5" tall and 2.75" wide including grip. 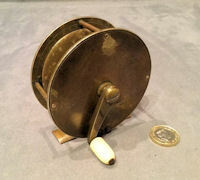 Original, quality circa 1900 / 1920's brass plate wind fly fishing reel with a 3.25" diam plate with a composition grip and in the unpolished finish. Complete and in good and working order. 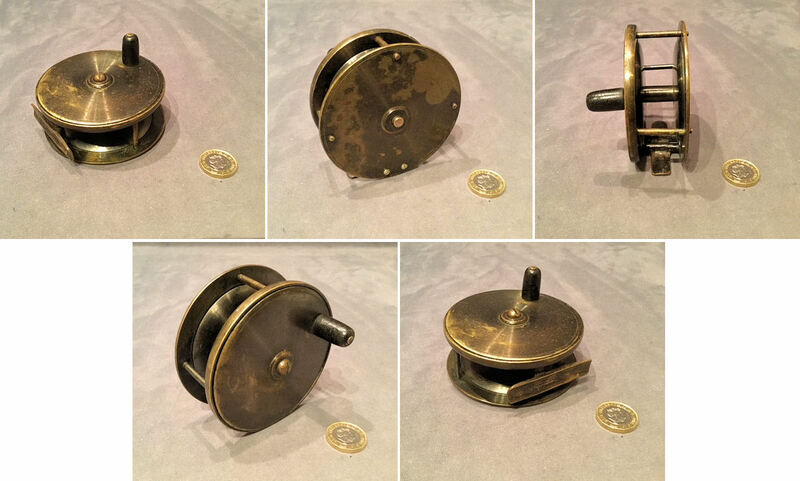 3.5" tall and 2.25" wide including grip. 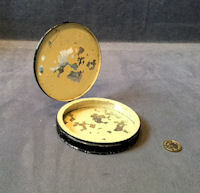 Original, quality 1920's circular tin box with a hinged lid and remains of the original cream paint to the inside and the japanned black to the exterior. 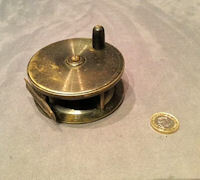 This well-made box was used to store fly fishing leader lines with a fly loaded. Some minor dents otherwise complete and in good and working order. 4.75" diam x 0.75". 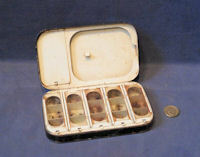 Original, quality 1920's rectangular shaped tin with rounded corners , a hinged lid and inner lidded compartments for flies and casts and leader lines. The interior has retained much of its cream gloss finish but the outside, originally japanned black, has lost its finish and has been cleaned and lacquered, otherwise all is complete and in good and working order. 6" x 3.5" x 1". 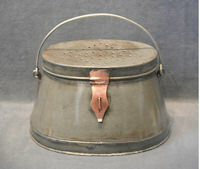 Original, quality, late 19th century, oval shaped "Anglers" galvanised live bait tin. 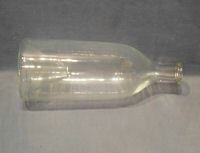 This example has tapered sides, a pierced hinged lid and a swing over wire handle. The shaped hasp to the front and the hinge to the rear are in copper, and all has been cleaned and lacquered. A most unusual bait tin, complete and in good order. Base 10.5" x 7.5" + 6.25" tall with handle down. 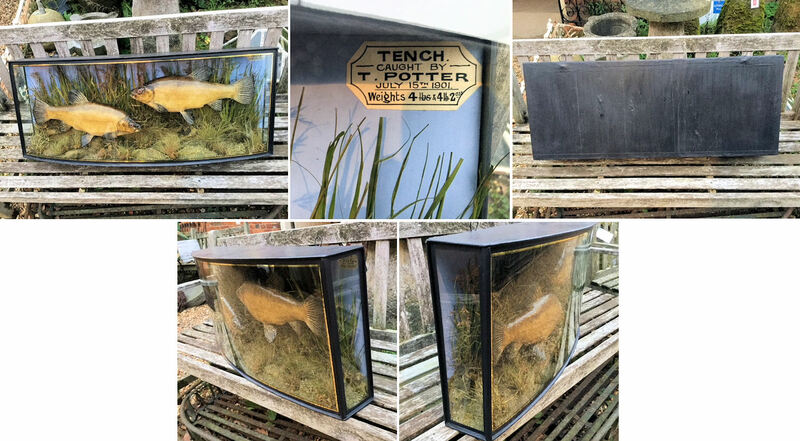 Original, quality, circa 1900, mounted brace of Tench in a bow fronted glazed cabinet with glazed end panels. 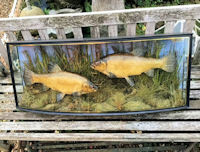 This super example has all the quality and realism of a Cooper mount but no detailed label to that effect, however the label does detail who caught them and where and the weights. "Caught by T.Potter, July 15th, 1901 Weights 4lbs and 4lb 2ozs". Again great groundwork typical of Cooper. The exterior of the case has been cleaned and repainted black and the original wire loops are intact for wall mounting. Complete and in good order. Cabinet 39" x 15.5" tall plus loop and 8" front to back at centre of bow front.